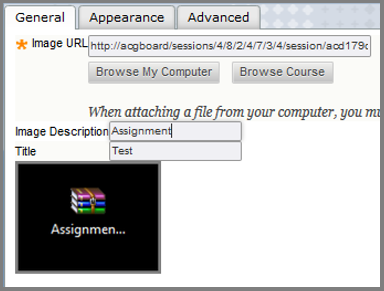 In Blackboard Learn you can upload files, add text, images and web links in various communication tools (blogs, wikis, assignments, journals, e.t.c.) by using the content editor (VTBE). The VTBE – Virtual Text Box Editor contains various tools for text formatting, adding hyperlinks, tables and attaching various types of files such as images. It has two views: The Simple Mode View and the Advanced Mode View. Click on the titles below to expand the tools descriptions. This mode contains the least possible set of formatting functions. This mode contains more advanced functions for formatting and objects attachments. To reveal the Advanced Mode view, click the double arrow button to the right. Redo the previous actionavailable only if an action has been undone. Move the text or object to the left (out dent). Click again to out dent further. You cannot out dent text beyond the left margin. Insert a non-breaking space character at the current mouse pointer position. Add a link to a file in the text box. The Insert Content Link window appears. You can link to the following file types: DOC, DOCX, EXE, HTML, HTM, PDF, PPT, PPTX, PPS, PPSX, TXT, WPD, .XLS, XLSX, and ZIP. You can link to a file from your computer, from Course Files, the Content Collection, or a URL. Embed a media clip in the text box or edit an existing selected media object. The Insert/Edit Media window appears. From the Type drop-down list, select one of the following: Flash (default), HTML 5 video, QuickTime, Shockwave, Windows Media, Real Media, lframe, and Embedded Audio. You can add media files from your computer, from Course Files or the Content Collection, or a URL. 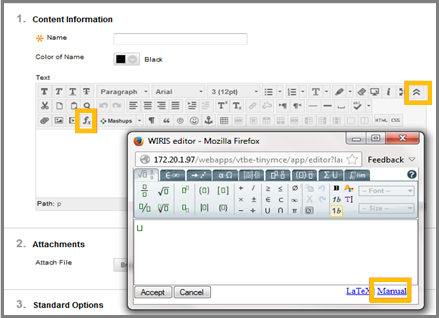 The Formula Editor provided by WIRIS is a part of the Visual Text Box Editor (VTBE) that enables full mathematical capabilities on Blackboard Learn. Use it for any kind of mathematical equations and problems. Click the double arrow button of the Content Editor so as to view all available tools. Click the button fx so as to activate the Math Editor and use the formulas. By clicking the Manual link you will find a manual for the math editor’s use. Important Notice: The Math Editor is not functional at the moment. This is a known issue for Blackboard and it is planned to be be fixed in a later update. Click on Browse My Computer to select a file to upload and click Submit. Click on Source URL to upload a web link. You can link to the following file types: DOC, DOCX, EXE, HTML, HTM, PDF, PPT, PPTX, PPS, PPSX, TXT, WPD, .XLS, XLSX, and ZIP. Single file upload should be up to 100MB. Click the image icon located at the third row of tools. The Insert/Edit Image window appears. In the General tab, click the Browse My Computer button to select an image to upload. You can add the following file types: GIF, JPG, JPEG, BMP, PNG, and TIF. You can add images from your computer, from Course Files or a URL. Optionally, type an Image Description and a Title. Set the Alignment of the image in relation to the text. Note: an image’s dimensions may approximately be 480-500 pixels in height and 480-500 pixels in width. Check the Constrain Proportions to change the image’s size proportionally. Add the Vertical Space of the image from the text, in pixels. Add the Horizontal Space of the image from the text, in pixels. Add a Border for the image, in pixels. 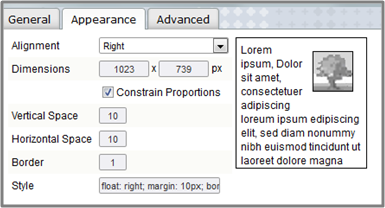 The Style displays the HTML code for the appearance settings. Click on Flickr Photo to search for, upload and embed a link to a photo from Flickr image hosting website. Click on SlideShare Presentation to search for, upload and embed a link to a presentation from SlideShare presentation hosting service. Click on YouTube Video to search for, upload and embed a link to a video from YouTube video-sharing website.